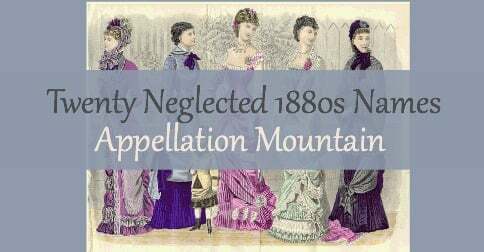 Let’s talk 1880s baby names! 1880s favorites Clara, Alice, and Grace are back. William and James never really went away, while Henry, Arthur, and Charlie are all fashionable once more. And yet some of the most popular names from the 1880s have yet to make a comeback. Conventional wisdom says that most names will return to popularity about one hundred years after their last peak, but that’s only true some of the time. Looking at the Top 100 for the decade of the 1880s as listed on the Social Security website, there are plenty of 1880s baby names that have long been neglected. A quick note on the data: the Social Security Administration didn’t start collecting name information until the 1930s, so these are names are reported by adults about themselves, rather than parents about their newborns. 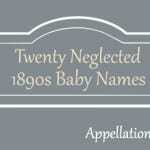 Now, on to the 1880s baby names that are overdue for revival! Ida was once a Top Ten favorite, as common as mini names like Ava or Mia today. With ties to Greek myth and a Tennyson poem, Ida could be quite stylish today. But it’s definitely among the more neglected of the 1880s baby names. Just 144 girls were given the name in 2014 – though that’s up from 99 in 2012. Florence – The Vampire Diaries’ Candice Accola and her musician husband Joe King recently gave the name Florence to their new daughter. The name of pioneering nurse Florence Nightingale, as well as the famous Italian city, Florence has been huge in the UK in recent years. But in the US, it’s been consistently overlooked. A mere 182 girls were given the name in 2014 – it left the US Top 1000 back in 1981, and hasn’t been back since. 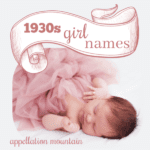 But with great retro nickname options like Flossie, this name could wear beautifully today. Martha is as homespun as Hannah, as tied to early America as Abigail. And yet, Martha – a former Top Twenty choice – charted at a frosty #735 in 2014. If you’re looking for a vintage, nickname-proof name that’s smart and steady, Martha is your girl. Mabel – Back in the 1990s, we were all watching NBC sitcom Mad About You, especially when Paul and Jamie couldn’t settle on a name for their daughter. They eventually named her Mabel, from the phrase Mothers Always Bring Extra Love. (Of course, Mabel comes from the Latin name Amabilis – lovable, so that’s a double dose.) The year was 1997, and a mere 42 girls were given the name. But it started to show signs of a tiny revival even then, with 90 Mabels born in 1990. The name recently returned to the US Top 1000, but remains relatively rare. Just 424 girls were given the name in 2014. A pop culture reference more likely to appeal to children today is Gravity Falls‘ young Mabel Pines. Helen is a tailored classic. Like Penelope, this name comes straight from Greek myth, but it sounds more like modern favorites than a romantic antique. The name was big in the 1880s, and would continue rising until it peaked at #2 from 1900 through 1919. But today? It hovers around the 400 mark, less popular than alternate form Elena and distant cousin Eleanor. Crushed that Charlotte and Evelyn are so popular? Move right down the list to the lovely, legendary Helen. Maude – In medieval England, the regal Matilda became the everyday Maud. (Probably via the Norman French form Mahaut.) Add an ‘e’ and you’ll have the form of the name that Americans embraced in the 1880s, when it ranked in the Top 40. But in 2014? A mere 14 girls were named Maude, and just 5 Mauds. It’s a short, complete name that feels unexpected and delightfully vintage. Plus Gabrielle Blair, better known as Design Mom, has a teenaged daughter named Maude, and Hollywood power couple Judd Apatow and Leslie Mann are parents to a young Maude, too. Agnes – While we’re talking Hollywood baby names, Jennifer Connelly and Paul Bettany made me notice this name when they welcomed Agnes Lark in 2011. Abby and Maddie are huge, and Maggie is making a comeback. But somehow Aggie – along with formal names Agnes and Agatha – remains in obscurity. 187 girls were given the name in 2014. That’s not the most obscure name on this list, but it’s still well outside of the US Top 1000. Mamie is a former First Lady name. The future Mrs. Eisenhower was born Mamie Geneva Doud, but it was often short for Mary or Margaret. 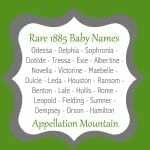 That makes it tough to track just how many Mamies there were at the name’s peak, but it was a Top 100 fixture among 1880s baby names. Just 25 girls were named Mamie in 2014, but this Cosmopolitan article pointed to one baby Mamie – a good sign, I think, that Mamie is prime for a comeback. Mae – Do I really need to declare Mae ready for revival? The name reentered the US Top 1000 in 2010, and has climbed into the 600s since. But that’s just it – a name ranked in the 600s is still decidedly underused. Mae has all the glamour of the larger-than-life Mae West, but a sweet simplicity, too, thanks to Edith Wharton’s May Welland, from The Age of Innocence, and the name’s ties to the merry springtime month. The name is as mini as Mia, but was given to just over 400 girls in 2014. Della – Ella is huge. Stella isn’t far behind. And yet, Della has yet to return to the US Top 1000. Just under 200 girls were given the name in 2014. The 2015 birth of musician Billy Joel’s second daughter, Della Rose, might spark some more interest in the name. Looking at 1880s baby names, Della was a Top 100 mainstay, not far behind Ella and Stella, so it makes sense that all three names would be in the spotlight again. Louis – We love Lu- names like Lucy and Luke. But the Lous have been passed over. Louisa just re-entered the US Top 1000 in 2014, and Louise remains in style limbo. Meanwhile Louis barely cracks the US Top 300, despite being chosen by Sandra Bullock for her son, and as part of Prince George Alexander Louis’ name. (And, of course, new dad and One Direction alum Louis Tomlinson makes this name feel plenty young.) Louis was the 19th most popular of the 1880s baby names for boys, so even though the Top 300 isn’t obscurity, this name still has far to climb. Martin should be bolstered by the heroic Martin Luther King, Jr. as well as the cocktail cool of actor-singer Dean Martin. But Martin, too, is currently in the US Top 300 – quite the tumble for a name once in the US Top 50. If you’re after a classic name less expected than William or James, Martin is one to consider. Grover brings to mind one thing only for most parents: the fuzzy blue muppet from Sesame Street. Today’s generation grew up with him. We expect to share Grover with our children. So how can it possibly be a child’s name, you might ask? It really isn’t these days – just 15 boys were named Grover in 2014. But it was a nickname for the kiddo in 2002 bestseller The Nanny Diaries. Grover also has the stylish ‘r’ ending of other surname names like Carter and Hunter. Factor in that stylish ‘v’ sound, and Grover could fit right in with Oliver and Everett. Harvey – Speaking of that stylish sound, is it any surprise that Harvey is showing signs of life? It’s like classic Henry, but turbo-charged by the letter v. On the small screen, legal drama Suits gave us a lawyer called Harvey beginning in 2011. After more than a decade outside of the US Top 1000, Harvey returned in 2011. But while this name is in the early days of a revival, it’s just barely inside the current US Top 500. As 1880s baby names go, Harvey remains an underused gem. Clyde was given to fewer than 300 boys in 2014. While that’s a number the name hasn’t seen since the 1980s, it’s a far cry from Clyde’s status as Top 100 boys’ name of the 1880s. Of course, back in the 1880s, Clyde was yet to be associated with the outlaw of Bonnie and Clyde fame, or Clint Eastwood’s pet orangutan in 1978 comedy blockbuster Every Which Way But Loose. In 2016, Clyde has shed any negative associations and sounds like a retro name that’s less cowboy than Colt, more vintage than Kai. Chester – Yes, I know. There’s the rhyming nickname. But whenever this comes up, half of the audience says “Huh?” It’s an association that’s fading. Instead, Chester could be one of those great ends-in-r surname names like Parker or Cooper. As a bonus, Chester comes with jazzy nickname Chet. 83 boys were given the name in 2014, making this one of the rarer names on the list – but that’s not necessarily a bad thing. Homer – Centuries before The Simpsons made this name the spokesperson for doughnuts and Duff Beer, Homer was a poet. And he’s still a widely read poet, the author of The Illiad and The Odyssey, a legendary name from the ancient world, at the heart of the Western canon. Homer was among the Top 100 1880s baby names, and would become even more popular in the early twentieth century. Today, the name is obscure, given to just 28 boys last year. And yet, if you can overlook a few D’oh jokes, it could be an edgy, cool name for a son born in 2016. Floyd – File Floyd with Clyde. They’re both names associated with crime – in Floyd’s case, Pretty Boy Floyd, an American bank robber who made the most wanted list during the 1930s. Other famous Floyds abound, including a fictional character on The Andy Griffith Show, but real world Floyds have been in short supply recently. Just 86 boys were given the name in 2014. And yet, with a short, retro sound, Floyd could make a comeback. Julius – How can it be that Julius isn’t more popular? Julian is big, and we’re wild for ancient names nowadays. But Julius hovers just above the 300 mark in the US. That’s not nearly as rare as Floyd, Homer, or Clyde, but neither is it as mainstream as Julian, Elias, or Silas. Rufus – While we’re talking about ends-in-s names for boys, what about Rufus? Rufus was just outside the US Top 100 for 1880s baby names. It’s fallen since then, and today it sounds sort of quirky-indie (I’m looking at you, Rufus Wainwright) or possibly British. (Hello, Rufus Sewell.) Over the past dozen decades or so, Rufus has gone from ordinary name to one teetering on the edge of extinction. Just 20 boys were named Rufus in 2014. So if you’re looking for a vintage rarity that your son will seldom have to share with another child? Rufus is one of the 1880s baby names that absolutely belongs on your list. 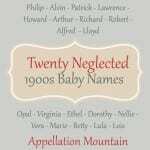 What are your favorite 1880s baby names? My favourites are Martha, Florence, Helen (though I prefer Helena), Louis (LOU-ee pronunciation only) and Rufus. All fantastic names, though the first two are very popular here in the UK. My favorites from the girl’s list are Mabel, Agnes, Mae, and Della. From the boys, Louis and maybe Martin and Julius. My great great-grandmother was born in the late 1880’s named Sylvia Mabel, but she went by Mabel. I always thought it sounded sweet and gentle, and I definitely see it as ready for a revival! Also, funnily enough, her husband, my great great-grandfather, was William Grover and went by Grover. Della and Martin are my favorites. The fact that Martin is spelled the same in several languages is a plus in my opinion. I like Mabel, Maud, Agnes, and Mamie from the girls’ list. For boys, Grover is my favorite here. If we have another child and if said child is a girl my husband has already brought up the name Florence. It was his grandmothers name. I neither love it nor hate it but I do feel like it could grow on me with time. My main concern is nicknames. Our son is named Maxwell and although I knew he would get called Max some my husbands family refuses to call him anything else and I do not like it. It makes me hesitate picking another nickname name. We have a Cressida Lux whose nickname is Ida. It’s a fab name and our Ida is a feisty blonde girl who answers to both Cressida and Ida. My boy is named Clyde. Before we were even dating my husband said, “If I ever have a son his name will be Clyde.” It sounded dusty and OLD to me at the time but when our first child was a boy how could I say no? It does suit him and we get mostly positive responses. There have a been a few “Bonnie and Clyde” jokes but we hear lots of sweet stories about favorite Uncles named Clyde. I like that there is 1 spelling and 1 pronunciation. It is almost never bungled and we have never met another young Clyde. Martha isn’t nickname proof. There’s Marty, Patsy, and Patty. I like Patsy the best.